First cut a 5 1/2" x 8 1/2" piece of Stampin' Up! Elegant Eggplant card stock and fold it in half for the base, a 4" x 5 1/4" piece of Stampin' Up! Wisteria Wonder for the middle layer, and a 3 3/4" x 5" piece of white for the front layer. Next dry emboss the front layer with a Stampin' Up! Honeycomb embossing folder, sponge the edges with Stampin' Up! Perfect Plum ink and attach it to the middle layer. Then cut and emboss the beaded oval out of Elegant Eggplant card stock with a Spellbinders Beaded Oval die. Next cut out the oval with a Spellbinders Classic Ovals Die, sponge it's edges and stamp the sentiment with Perfect Plum ink and a stamp from a Stampin' Up! Happiest Birthday Wishes set, attach it to the beaded oval then to the front layer. 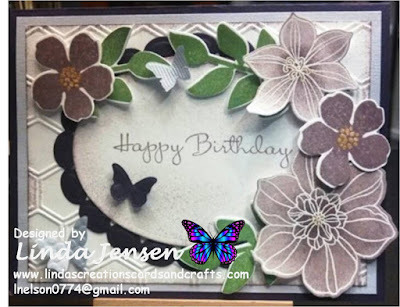 Then heat emboss the flowers in the bottom right and top right corners with Versamark ink and white embossing powder, then sponge them with Stampin' Up! Wisteria Wonder ink making them darker in the middle. Next stamp the other two flowers in Perfect Plum ink, add Gold Lame Smooch Accent ink to their centers, then stamp the leaves three times in Stampin' Up! Gumball Green ink. Then cut out all flowers and leaves with Stampin' Up! Secret Garden Framelits dies and attach them around the oval with mini pop dots. Next cut the butterflies out of Wisteria Wonder and Elegant Eggplant card stocks with a Stampin' Up! Beautiful Wings Embosslit, attach them to the front layer with mini pop dots, attach the front layer to the base and enjoy!